Kids love to collect keychains and your cow-lovin', keychain-collectin' child will be excited to add this adorable little plush cow keychain to his or her collection. Cute and cuddly from every angle, this cow stuffed animal keychain is sure to delight with its soft black-spotted white fur, pink nose, inner ears and horns, and sweet smiling face. And there are no worries about finding the perfect pasture for your new pet as this little cow is perfectly content to simply lie on its tummy or sit up and watch you when it's not adventuring with you on your backpack, purse, belt loop, or simply looped around your finger. Having a farm-themed party? 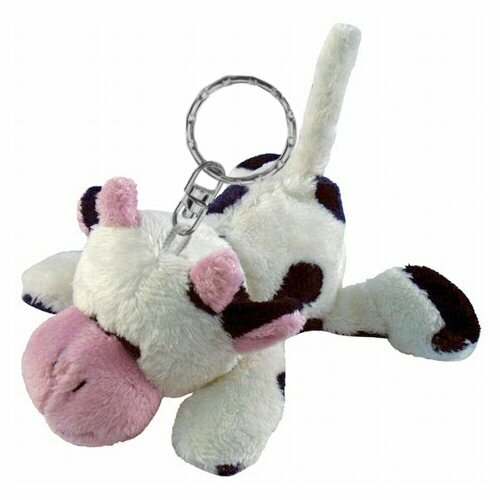 Cow plush keychains are also great for birthday treat bags and giveaways! Fun Cow Facts: Did you know that an average 1,000 pound cow produces about 10 tons of manure each year? That's a lot of fertilizer to make a healthy garden! This adorable little cow Page Pal plush bookmark has a soft white body with black spots, light pink inner ears, and a sweet face. This adorable plush paint horse clip-on has soft spotted fur of light brown and white, fluffy mane and tail, and sweet face.